Don’t want to miss out the updates to the shop? Then I would suggest you to join the Facebook group! Please do not hesitate to write a post if you have something you wish to see or to reappear in the shop. The theme for Blythecon Japan 2016 was Birthday as the Neo Blythe turned 15! To commemorate this I have made special graphic and here is a card printout of the graphic as well as two round stickers. 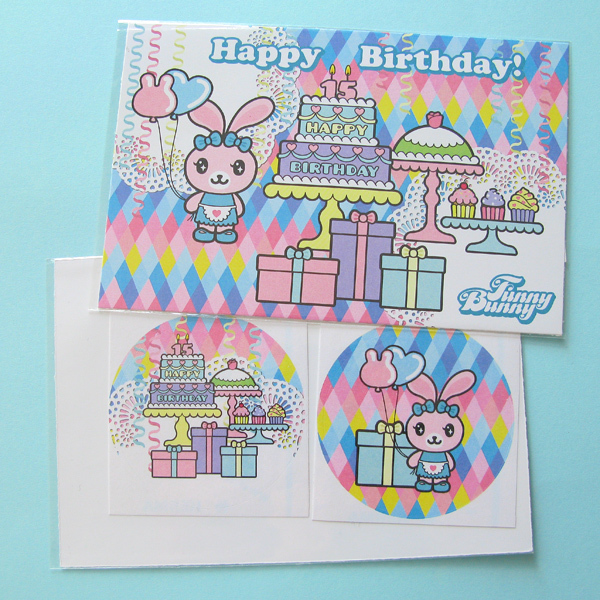 The card is 15x10 cm and the stickers are about 6 cm across. The graphic is my own creation and copyrighted by me. Neo Blythe: The normal Blythe size, the biggest of the three sizes. Kenner Blythes, Ashton Drake Group Blythe, Takara Neo Blythe BL, EBL, SBL, RBL, FBL. Some other dolls such as Takara Licca and the early vintage Mattel Skipper may also be able to wear the clothes. Doll height: 29 cm, body height: 17.5 cm. Middie Blythe: This is the newest Blythe size, in between Neo and Petite. There are only Middies from Takara. Doll height: 20 cm, body height: 12.5 cm. Petite Blythe: This is the smallest of the Blythe sizes. Takara Petite Blythe and Hasbro Littlest Pet Shop Blythe. I do currently not have clothes for this size. Doll height: 11.5 cm. Emerald Witch: Doll height: 17 cm.